She is an accessory to 17 counts of 1st degree murder. She had a hand in causing the shooting to take place by bullying Cruz for 3 years. She admitted to the bullying and acted like she was totally justified in doing the bullying – no clue to “cause and effect”. Some kids who are bullied wind up committing suicide and the bully is rarely held accountable for their actions. It wasn’t the gun, it was her and her fellow heartless bullies. The old warriors paid for freedom in blood. The grandchildren rewrite history and tear down monuments while marching for their ‘rights’ to be enslaved, wearing Cuban flags on their sleeves. To make him sound more child like. He doesn’t have a car, most high school seniors have at least access to a car. 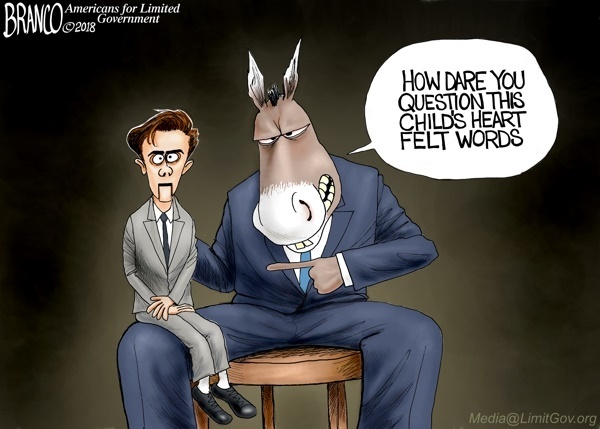 Totally indoctrinated, crisis actor, David Hogg is a mere puppet.